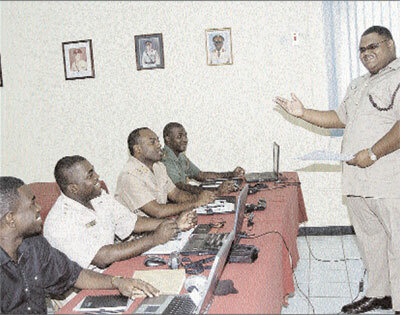 Captain Gosma Buddoo (standing), assistant training officer at the Jamaica Combined Cadet Force (JCCF), addresses a group of regional training officers and staff officers yesterday. Members of the JCCF joined their local counterparts for a workshop at the Cadet Headquarters at Up Park Camp in Kingston. Caption: Captain Buddoo: let us stand and sing our theme song, afta two, one... two...altogedda sing ! Caption: After a stirring rendition of "I Believe I Can Fly", Capt. Gosma Buddoo was sadly rejected for the Rubben Studdard look-a-like contest. Subsequently, he lost weight and now poses as Supercat. Caption:"By cutting out dumpling and curry goat, I am well under way to reaching my weight-loss goal! ", Capt. Buddoo tells a delighted panel of weight compliance officers at Up-Park-Camp Tuesday. New rules for officers to be "trim and fit" went into effect last month, and many JDF oficers are rushing to meet the new standards. Caption: cho!! a big bellyman rule all de time. Caption: Captain Buddoo delivers an aria from Madame Butterfly to a delighted panel of judges in the annual JDF opera auditions. Buddoo got the part but later confessed he only came to the audition for the free patties and cocoa bread being offered. Caption: Captain Buddoo telling cadets: Yeah man after a few years of grungy street work with criminals, unoo wi get a easy job like this, wich will allow for contentment. Look pon mi!! Caption: "my youth u tink a joke mi come ya fi give." Thank you for the 138 responses we received. Enter again and we hope you will be the outright winner next time.